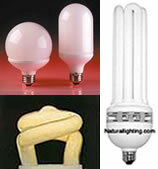 Compact fluorescent light bulbs with medium and mogul screw in bases. Wattages range from mini 13 watt to 200 watt high output (voltage - 120, 220, 277, and 347). Color temperatures include 2700K (warm tone), 4100K (Cool White), 5000K (Natural Day Light), 5500K (Full Spectrum Vita-Lite and SunPro Full Spectrum), and 6500K (Day Light). TCP, Westinghouse, Maxlite Highmax, Ushio, Eiko. *** Special adaptors are available for socket sizes - Medium base to Mogul base, Mogul to Medium base.